An eversion ankle sprain is a tear of the ligaments on the inside of the ankle. It is not as common as an inversion ankle sprain and occurs when the ankle rolls too far inwards. An eversion ankle sprain is often accompanied by a fracture of the fibula bone. The athlete will usually know they have sprained their ankle as it collapses under then with significant pain. With an eversion ankle sprain, the ankle usually rolls inwards stretching or tearing the ligaments on the inside of the foot. There will be immediate pain on the inside of the ankle after twisting it along with rapid swelling and bruising. The patient will have difficulty weight bearing and limited ankle mobility. In moderate to severe eversion ankle sprains it is always recommended that an x-ray is requested to rule out fractures. The ankle joint is held together by supporting ligaments which join bone to bone. 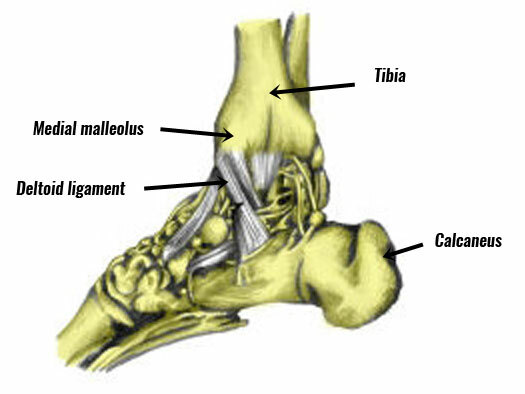 The lateral ligaments are on the outside of the ankle and include the talofibular ligament (joins the talus to the fibula) and the calcaneofibula ligament (joins the calcaneus to the fibula). The medial ligaments are on the inside of the ankle and consist of the tibiotalar ligament (joins tibia to talus bone), the tibiocalcaneal ligament and the tibionavicular ligament which altogether are known as the deltoid ligament. What is an ankle eversion sprain? An eversion sprain is a tear of the deltoid ligaments, on the inside of the ankle. It is often called a medial ankle sprain or a deltoid ligament sprain. These ligaments provide support to prevent the ankle from turning inwards or everting. It is rare for the deltoid ligaments to be sprained for two reasons. 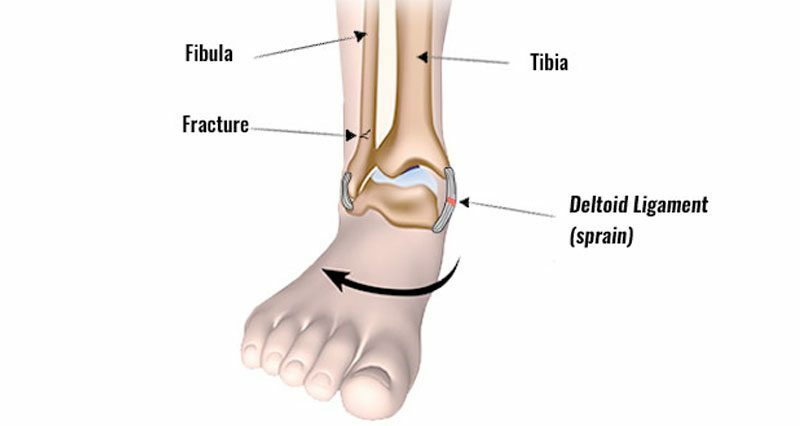 The fibula bone tends to prevent the ankle from moving far enough to sprain or overstretch the ligaments on the inside of the ankle. It simply does not allow the foot to move far enough to cause damage. Another reason is that the medial ligaments on the inside of the ankle are much stronger than the lateral ligaments on the outside. For this reason, an eversion sprain is often associated with a fracture of the end of the fibula bone called the lateral malleolus which can be felt as the bony part on the outside of the ankle. This is known as a Pott’s fracture and requires immediate medical attention. Other bones in the ankle such as the talus can also be fractured during an eversion ankle sprain depending on the severity of the injury. Initial treatment should involve applying the PRICE principles of rest, ice, compression and elevation. Rest is important both immediately after injury as well as whilst the injury is healing. Continuing to walk or play on while it is painful will increase swelling and slow the healing process. If it is a severe sprain or a fracture is suspected then seek immediate medical assistance. An X-ray may be required to determine the extent of the injury. Apply ice or cold therapy immediately after the injury. Ice should not be applied directly to the skin but in a wet tea towel or use a commercially available hot and cold pack which are often more convenient. Cold therapy can be applied for 10 to 15 minutes every hour for the first 24 to 48 hours and reduce the frequency as symptoms improve. Compression with an ankle taping or compression bandage will protect the joint from further injury and help reduce swelling. Elevating the limb encourages the swelling and tissue fluids to flow away from the site of injury. This treatment should continue until all bleeding has ceased (usually 48-72 hours). Further treatment should involve regaining full mobility and strengthening the ankle to prevent future injuries. Mobility exercises can begin as soon as pain allows in a forward and backward motion so as not to stress the healing ligaments. As the injury improves and pain allows ankle strengthening exercises and exercises to improve proprioception such as wobble balance board exercises should be done. Medial ligament sprains are treated the same way as lateral ankle ligament sprains although recovery can take twice as long. Following an ankle eversion sprain, the joint often becomes very stiff and the range of motion at the joint is reduced considerably. Mobility exercises for the ankle can start very early in the rehabilitation process from day 2 in mild to moderate sprains. Lateral (sideways) movements should be avoided in the early stages so as not to put any stress at all on the injured ligaments. Later when pain allows exercises with lateral movements involving sideways motion can be done. Active exercises can be done in the early stages and will help prevent the ankle from seizing up. Simply pull the foot up as far as it will go (dorsiflexion), hold for a couple of seconds and then point it away from you (plantarflexion) and hold again. A good method to start with is to perform 2 sets of 20 reps whilst the ankle is iced and elevated. The advantage of this exercise is that the damaged ligaments will not be stressed by sideways movement, the calf and shin muscles maintain strength and the pumping motion helps to decrease swelling. This exercise will mobilize the ankle ‘sideways’ and so starts to stress the damaged ligaments. It should only be started when pain allows and healing is established. Simply turn the feet so the soles point outwards and then inwards. The movement should be gradual and within the limits of pain. Circling the ankle will also move the joint into these positions. Once you can do so pain-free, try exercises involving eversion and inversion to help strengthen the muscles which help to control the ‘rolling’ action at the ankle. Isometric means there is no movement at the joint throughout the exercise. A partner or therapist can provide resistance with the hands, or use a wall or chair leg. For eversion, the athlete should try turning the ankle out against resistance. For inversion, inwards against resistance. Hold for 5 seconds, rest for 3 seconds and repeat initially 3 times and gradually increase up to 10 times. As strength improves, this can be extended using a partner or therapist into a more dynamic action of the therapist moving their hands against the ankle which much react to prevent it moving. Ankle exercises will progress to more dynamic exercises involving movement, along with proprioception or balance exercises, then eventually functional or sports specific exercises to bridge the gap between rehabilitation and full training and competition. Read more on ankle sprain rehabilitation exercises.